Today I was working in Yorkshire, quite a distance from home and when we arrived, the village had the ruin of a castle. But these are no ordinary ruins. These ruins are rather splendid ones. The Normans were descended from Vikings who settled in what is now Northern France. When the Normans invaded England and won, the land was shared out between them . Conisbrough Castle is in South Yorkshire. There was an earlier Saxon fortification on the site but the Norman castle was built in the 11th century by William de Warenne, a major landowner and favourite of William the conqueror. The Norman de Warrennes were given vast tracts of land in England as a thank you for their loyalty and the name continues in London with the place name Warren St. Hamelin Plantagenet and his son William rebuilt the castle in stone and it stayed in the family before returning to the Crown in 1461 around the time The House of York regained the throne. . The ruins were bought by the Duke of Leeds in 1737. Sir Walter Scott used the castle as an inspiration for his 1819 novel Ivanhoe. They are now owned by English Heritage. These lovely photos were taken by my husband. Although a ruin, this castle is worth a visit. Parts of it are in remarkably good condition. The keep below is known to be the best preserved keep in England . This well is in the centre of one of the family rooms. The family could send down a bucket to get water, hopefully clean. This must have been quite a thing at the time. What every wealthy wife would want! Below you will see a sink. It is in what was one of the main family bedrooms of the castle. Despite being a ruin of something nearly 1000 years old, some of the details are still in excellent conditions. Archways were quite a feature of Norman architecture. View from the top down into the castle. The stone steps lead up to the top.This is a fabulous view. It was taken from the top of the ruin down into the inside. The windows were intentionally small and were so such as a means of defence and also for heat. Normans introduced the Mott = mound and Bailey = enclosure castles to England. 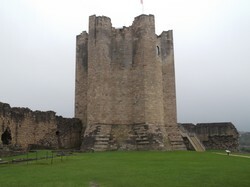 Conisbrough has an inner and outer bailey. The toilet "waste " went down to the water below the castle. If you get an opportunity to visit, please do. You won't be disappointed. Ty . that should help people who have not heard of one. A windlass is a roller attached to a handle for winding. The rope is fastened to it and the bucket to the other end of the rope. The depth of a well is determined by the depth of the water table. On my allotment we have an old well that has some water at about six feet depth, but we are a low-lying area. In droughty times and drier areas the water table is reached further down than in wetter situations. .
A gallon of water weights ten pounds, but sometimes the kitchen staff would use a windlass, which would make pulling up the bucket easier. Isn't it incredible. I have looked out two web sites that you may find interesting in answer to your questions. Water weighs quite heavily so I would think it took strong arms to heave it back up. Veronica, Thank you for the lovely tour into castle life 1,000 years ago. With materials that keep in the heat and windows that keep out the cold, it must have been horrible to work in the kitchens! Do you know how far the drop is for a bucket into the well, and how easy it was to pull it back up full? I prefer traditional spellings in most things. Be careful with Gaelic spellings. I have some knowledge of the Gaelic, and while it is a lovely language, the spelling system is its great difficulty. There is nothing in Gaelic more difficult than the spelling, as it does not clearly link to its sound. Skye is merely an anglicised shortening of Sgithenach . I forgot to say that the ch at the end of the world is not always pronounced. For example, Sligeach is pronounced Sligo.